Welcome to the Best Western Premier Herald Square! Select this great Best Western hotel in New York, New York and enjoy a host of convenient amenities at a great value while traveling. The Best Western Premier Herald Square is conveniently located with easy access to key area attractions and business locations. Hotel guests will appreciate the variety of nearby dining and shopping options. Each well-appointed room features free high-speed Internet access, free long distance access, toiletries, iron/ironing board, coffee/tea maker and hairdryer. King size beds and other upgraded amenities are available in select rooms. Our friendly staff is ready to ensure a comfortable and memorable stay. 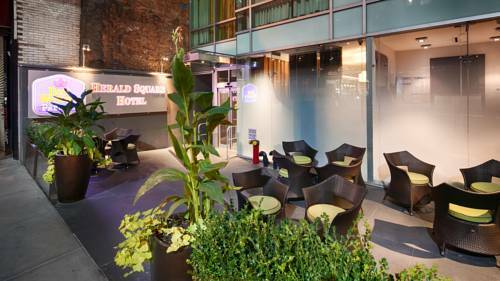 Make an online reservation today and save at this New York, New York hotel! Enjoy your stay! 0.05 mile(s) from Christian Dior New York, this store, with its history of chic design and elegant style, sits on the same block as Burberry, Yves Saint Laurent, and Chanel. It features men's and women's wear and distinguished accessories and perfumes. 0.05 mile(s) from South Street Seaport, located on the waterfront (of the East River) in downtown Manhattan. It is home to over 120 shops, restaurants, cafes and kiosks. 0.08 mile(s) from The Woolgathering, needle work enthusiasts, be it knitting, sewing or crocheting will delight in the yarns, fabrics and accessories available at this Upper East Side store. 0.05 mile(s) from Chanel, launched in the 1960s, Chanel is a multi-story flagship, offering many shopping options, from women clothing to cosmetics, handbags, shoes and accessories. 0.05 mile(s) from Prada, features a wide selection of men's shoes, women's bags and many fashionable Italian items. 0.05 mile(s) from Korliss Fashions, has been in business since 1947 providing quality outerwear and sportswear in wools, cashmeres, microfibers, silks and more. 0.05 mile(s) from Dolce & Gabbana New York, this internationally known Italian designer brand demands to be looked at. Whether it is crocodile-skin stilettos or wild leopard print dresses or Marilyn Monroe print tops you will see and take note. 0.05 mile(s) from American Broadcasting Company, an American commercial broadcasting television network. Created in 1943 from the former NBC Blue radio network, ABC is owned by The Walt Disney Company. 0.02 mile(s) from CBS Corporation, an American mass media corporation focused on commercial broadcasting, publishing, billboards and television production, with most of its operations in the United States. 0.05 mile(s) from American Express Company, an American multi-national financial services corporation headquartered in Three World Financial Center, New York City. Founded in 1850, it is one of the 30 components of the Dow Jones Industrial Average. 0.05 mile(s) from ABM Industries Incorporated, an American corporation involved in outsourcing, building maintenance, and facility management. 0.02 mile(s) from NBC Universal Incorporated, an American media and entertainment company engaged in the production and marketing of entertainment, news, and information products and services to a global customer base. 2.00 mile(s) from New York Law School, a private law school in the Tribeca neighborhood of Lower Manhattan in New York City, New York. The school is located within four blocks of all major courts in the borough of Manhattan in New York City. 1.00 mile(s) from Columbia University, an American private Ivy League research university in New York City. It is the oldest institution of higher learning in the state of New York, the fifth oldest in the United States. 1.00 mile(s) from New York Institute of Technology, a private, non-sectarian, co-educational research university in New York City. NYIT has five schools and two colleges, all with a strong emphasis on technology and applied scientific research. 0.08 mile(s) from Ellis Island Immigration Museum, offers visitors a fascinating look into the immigrant experience. Interactive exhibits, walking tours and movies reveal the hardships and challenges faced by immigrants passing through Ellis Island. 0.05 mile(s) from Museum of Modern Art, or MoMA as it is popularly known, is the largest art museum in the country with 135,000 specimens of painting, sculpture, photography, films, and drawings. 0.08 mile(s) from New York Botanical Garden, the 250-acre New York Botanical Garden owns one of the world's biggest plant collections in an herbarium with four million specimens. The Bronx Zoo is home to more than 4,000 animals in natural environments. 0.01 mile(s) from Empire State Building, it was once the world's tallest building. 1.00 mile(s) from Battery Park, a good place to start is where the Dutch explorers first settled in Battery Park on the southernmost tip of Manhattan, which offers spectacular views of the harbor and the Statue of Liberty. 0.05 mile(s) from The New York Stock Exchange, offers free tours and a visitor's gallery to observe the hectic activity; for a more peaceful perspective.